You get to sit in front of people who had to kiss up to their corporate suite-owning boss. 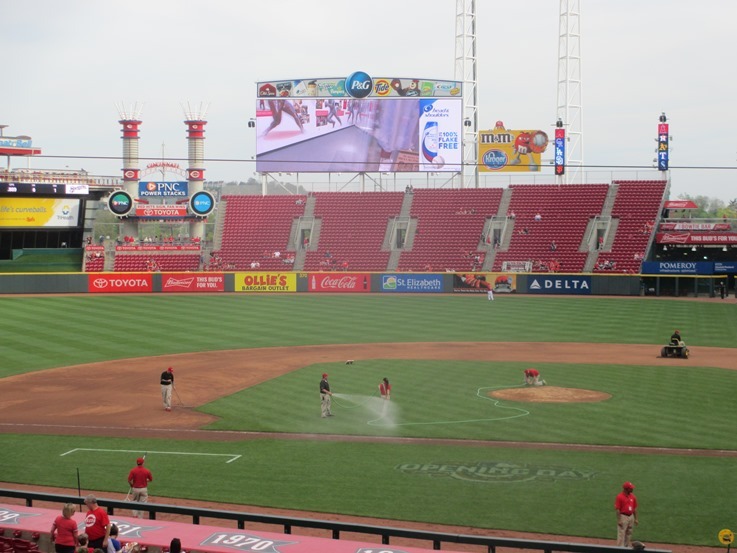 Great American Ball Park Seating, Tip #1) The Champions Club. Like with their neighbors in Cleveland, the club seats at GABP are on the mezzanine level on the first base side, over the field level seats. The seats here are wider than most and padded, have a great view of the action and a straight ahead view of the Big Board, and best of all include access to the climate-controlled Champions Club and its buffet. The buffet with non-alcoholic drinks is included in the ticket price, and features Cincy greats Montgomery Inn BBQ sandwiches and LaRosa’s pizza, along with a carvery and Asian food station. 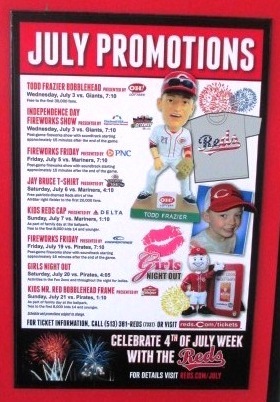 At ballpark prices, you should be able to get your money’s worth on that. Don’t be fooled by the sparse crowd. It’s not the best grounds crew vantage point. Great American Ball Park Seating, Tip #2) The Sun/Moon Deck. The Sun/Moon Deck area in right field is so named for your ability to see the sun or the moon easily from the section, which isn’t covered anywhere. There’s actually a pretty nice view of the Cincinnati skyline from here as well. The Sun/Moon Deck is a popular spot for the river breeze and the proximity to great food and the kids’ play area; just make sure that you’re protected from the sun on those blazingly hot Cincinnati summer days. They have misters nearby in center field. See what they did there with the Gap? Better cheap seats! 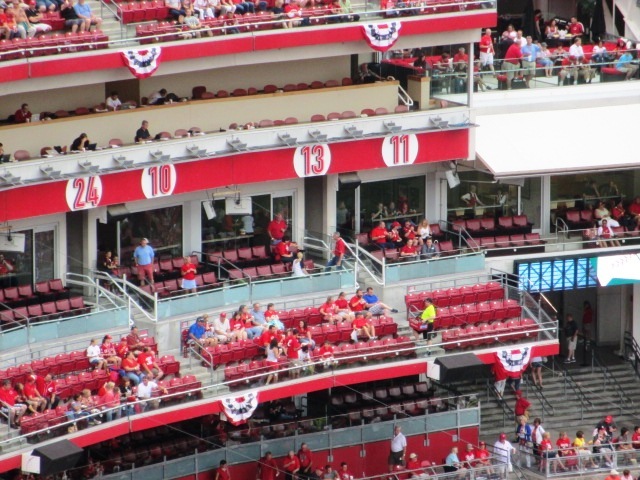 Great American Ball Park Seating, Tip #3) The Mezzanine. 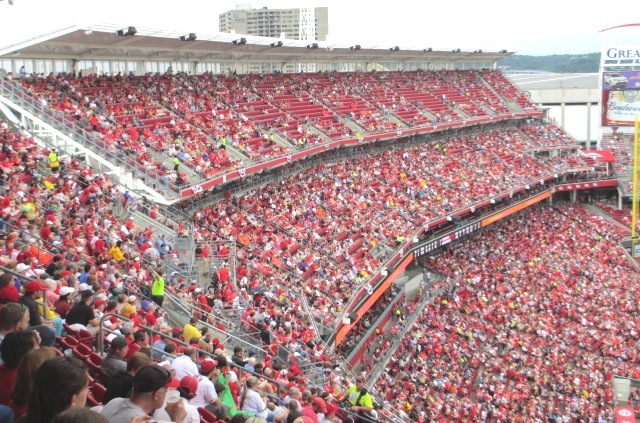 The Mezzanine is what the Reds call the larger 400 level sections that were created as a result of the Gap. Mezzanine seats are almost as close to the field as the Champions Club seats on the first base side, but they are much cheaper, and they have a superb view of the river beyond the outfield. They don’t include food with your ticket like Club seats do, but you’ll have more than enough money left over with these to enjoy a decent meal in the Machine Room, which is also in the upper level in left field and is also climate controlled. See, I think about this stuff. That’s just three seating areas of Great American Ball Park; you have a lot more to choose from, like the Scout seats, the Diamond Club or the bleachers. If you’re going cheap, check out this post.